When Rocco Wood was born three months premature he weighed less than a bag of sugar. He also had quadriplegic cerebral palsy. Louise, his mother, realised that life would be tough, and vowed that she would do all she could to make sure that Rocco’s life was about opportunities, not obstacles. Seeing Rocco now, a bright-eyed nine-year-old who weighs in at a healthy five stone, it’s clear that Louise is doing just that. Cerebral palsy means that Rocco can’t walk, talk or sit unaided. Yet, he is a happy and sociable child who loves to be around people and to paint, bake, play with switch-adapted toys, and watch cartoons. Rocco had nothing comfortable or suitable for sitting on after a busy day at school or at weekends. (NHS funds outdoor only wheelchairs.) 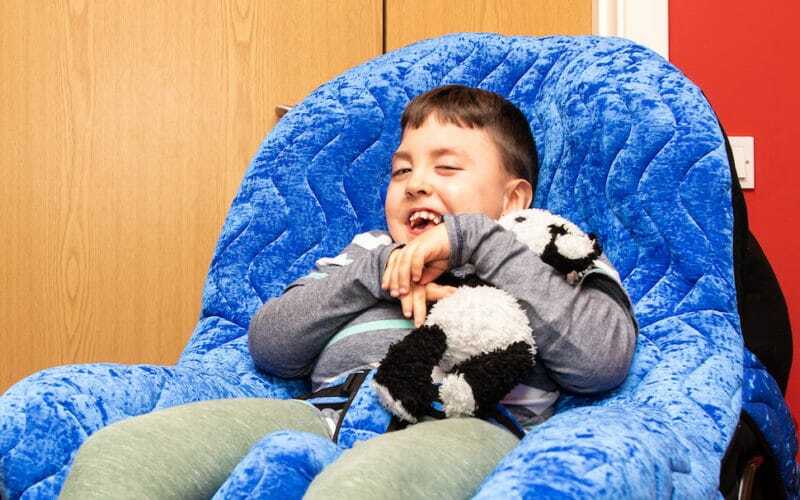 After many failed attempts to find a solution, Louise came across the P-Pod: a beanbag that offers positioning support for children and young adults. It’s also mobile and has a tray for toys and more! Find out how an Ecas grant could help you or a physically disabled person you know. Touched by Rocco’s story? Find out how you can help raise funds to help other people experience opportunities rather than obstacles.